This is an old revision of this page, as edited by 202.154.109.66 (talk) at 04:56, 19 January 2009 (→‎History). The present address (URL) is a permanent link to this revision, which may differ significantly from the current revision. Dried organic apricot. It is dark because it has not been treated with sulfur dioxide (E220). Dried fruit is fruit that has been dried, either naturally or through use of a machine, such as a food dehydrator. 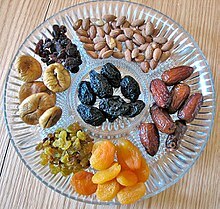 Raisins, prunes, and dates are examples of popular dried fruits. Other fruits such as apples, apricots, bananas, cranberries, figs, kiwi, mangoes, pawpaw, peaches, pears, persimmons, pineapples, strawberries, and tomatoes may also be dried. In addition to dried whole fruits, fruit purée can be dried in sheets to make fruit leather. Drying preserves fruit, even in the absence of refrigeration, and significantly lengthens its shelf life. When fresh fruit is unavailable, impractical, or out of season, dried fruit can provide an alternative. It is often added to baking mixes and breakfast cereals. Since dehydration may result in water loss up to seven parts out of eight, dried fruit has a stronger flavor than its fresh counterpart. The drying process also destroys most of the Vitamin C in the food. Commercially prepared dried fruit may contain added sulfur dioxide which can trigger asthma in susceptible individuals; dried fruits without sulfur dioxide are also available. The sulfur is added to make the color of the product more appealing. "Organic" dried fruit is produced without sulfur dioxide, which results in dark fruit and a flavor more closely resembling the fresh fruit from which it came. The color of some fruits can also be "fixed" to some extent, with minimal impact on flavour, by treating the freshly cut fruit with a preparation rich in Vitamin C (e.g., a mixture of water and lemon juice) for a few minutes prior to drying. In recent years there has been a tendency towards dried fruit that is sold as "ready to eat". This fruit has to be stored in sealed containers to preserve it. Notably prunes and apricots prepared in this way lack the positive chewy texture of properly dried fruit. Not much is known of the origins of dried fruits, but some assume that it originated in Caucasus, mainly in Armenia and Persia where dried fruits (notably apricots) are a big part of the culture. It may even be possible that dried fruit was created by Inca's in earlier years. Dried fruit can be consumed as is – either on their own or mixed, as into breakfast cereal such as muesli – or can be rehydrated by steeping in water. For instance, wolfberries are traditionally brewed in tea, plumpening in the process. Dried vine fruit - generic term for dried grapes that includes raisins, sultanas and currants. ^ Sulfites: An Important Food Safety Issue- August/September 2000, posted online by the US .